It’s been a busy week, (busy with fun and beautiful things) so I apologize for the delay in posting. Last weekend, my friends Roy and KD came to visit. They just moved to Chapel Hill, NC from Maryland, but they are originally from Korea. KD is a certified acupuncturist and Eastern Healer, and Roy has a lot of knowledge about Korean farmers that he is now extending to Permaculture. We had an amazingly fun time!!! Roy and KD brought us Jerusalem Artichokes (aka Sunchokes), which we planted by the CFF entrance. Hoepfully, visitors will be regaled with tall yellow flowers when they first enter the property. In Korean, Jerusalem Artichokes are called “pig potatoes” because these creatures will find them and dig them up. We’ll see if any critters try to uproot our Sunchokes. We hiked around the property and discovered that there are many medicinal plants growing at Crow Forest Farm. 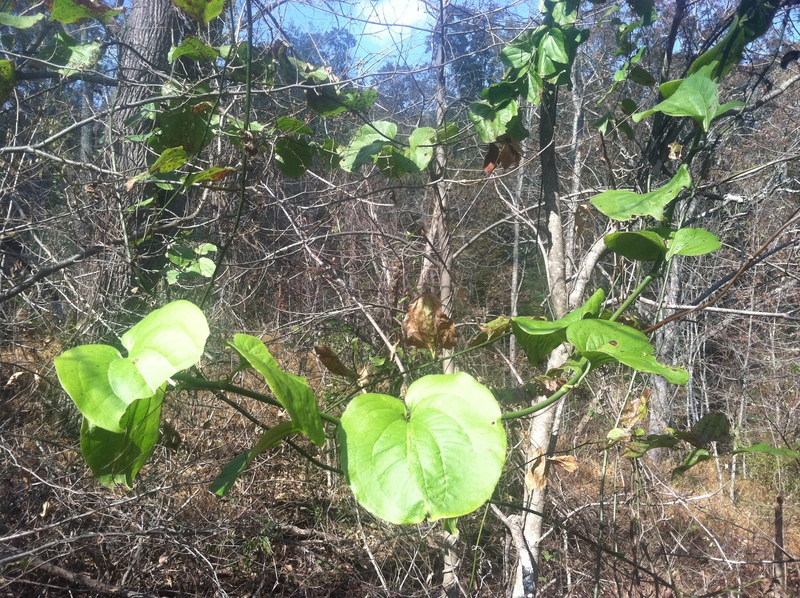 We may have discovered a new guild: to-bok-ryoung (Rhizoma similacis) growing up a paw paw tree and paw paw trees! Apparently, to-bok-ryoung is used as a detoxiying and chelating agent. It is winding all up and down our paw paw trees. Could we be on to something? Roy and KD also informed me of many wild delicacies growing right under our feet. 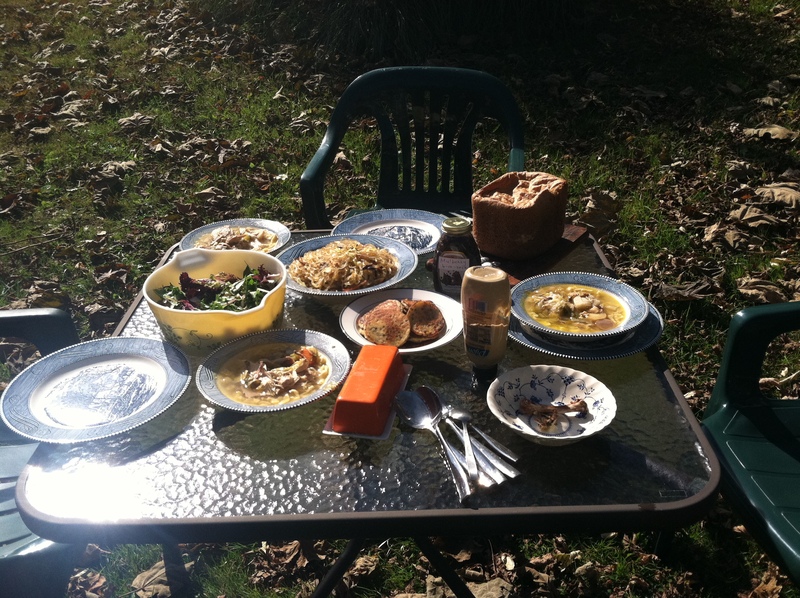 We assembled a delicious meal of foraged salad, Jap Che (Korean Sweet Potato noodles), fermented mulberry sauce, chicken soup and home-baked bread. 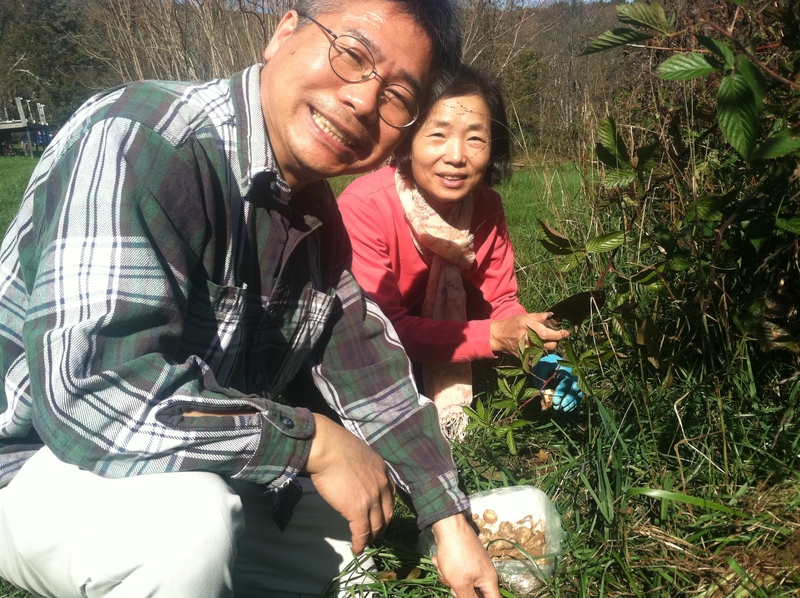 We are discussing having a food foraging/Korean medicine workshop at CFF in the Spring. Deep warm thanks to Roy and KD– Please come visit again!!!! A delicious meal! Jap Che (Korean Sweet Potato noodles), fermented mulberry, mung bean pancakes, chicken soup and fresh-baked bread… don’t forget the foraged sorrel and sunchoke salad!